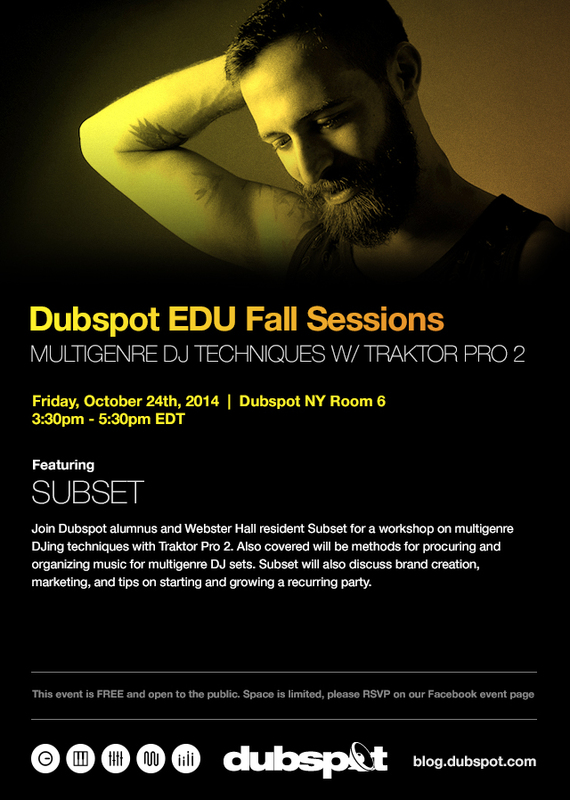 On Friday, October 24th, we continue our series of FREE workshops at our NYC campus with a presentation on multi-genre DJing with Subset. 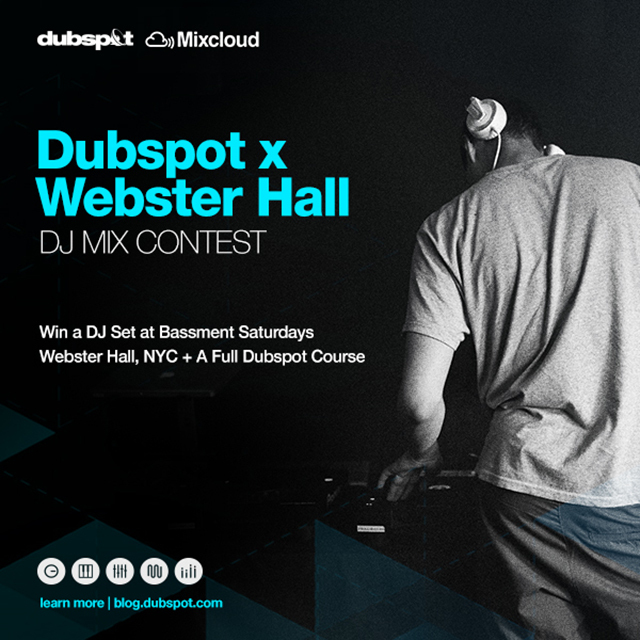 Dubspot has also teamed up with Mixcloud, Bassment Saturdays and Webster Hall to offer you the chance to win a DJ gig with Mayhem and Subset in NYC on November 15th, 2014! Former Dubspot student and staff member, Subset (aka Mark Martinez) is constantly making waves in the New York bass music scene. His on-going weekly party, Bassment Saturdays at Webster Hall, is one of the biggest parties in New York City. In this workshop, Subset will comprehensively go into techniques of multi-genre DJing with Traktor Scratch Pro 2. Mark will also give tips for brand creation and running a successful party. Also check out our exclusive contest below for a chance to play at Webster Hall for Bassment Saturdays this November. And check out Bassment Saturdays every Saturday at Webster Hall in New York. This event is FREE and open to the public. Space is limited, seating is first come, first serve. Want to play at the biggest club in New York City for one of the best bass music parties in the United States? In our new contest with Mixcloud and Webster Hall, you can win the opening slot for Basement Saturdays with Mayhem and Subset at Webster Hall, November 15th, 2014. Contest ends on Monday, November 3rd, 2014. To win, make a mix and submit it to Mixcloud (make sure to follow our detailed instructions below). Our judges will pick three finalists to perform at Webster Hall for our judges. The winning DJ will perform at Bassment Saturdays. First prize winner will perform at Webster Hall on November 15th with Mayhem and Subset. Top 3 finalists will get to perform a private set for Webster Hall judges. Top 10 most votes will receive a limited edition Dubspot t-shirt. Create a 30 – 45 minute mix of your favorite bass music and upload to Mixcloud. Mixes must be no longer than 70 minutes. Send the mix around and play it to your friends and fans, but don’t spam unknown people for this. Any attempt to falsify play counts will result in disqualification. You must include a 150 word biography and a photo of yourself with your entry. Tag the mix “Dubspotcontest” – If you fail to tag it correctly, your entry may be missed. The top 15 most listened-to mixes that are uploaded on Mixcloud and tagged with #Dubspotcontest will get reviewed by our judges. Representatives from Dubspot and Webster Hall will review each of these 10 mixes and select three finalists. Those three finalists will get the opportunity to perform a private set for our judges at Webster Hall. This will include feedback from the judges and will be filmed and released on Dubspot.com. The judges will then vote for their favorite performance. The winner will then get to perform alongside Mayhem and Subset on November 15th.